Could Unmix::Drums be a remixer's best friend? MUSIKMESSE 2015: Zynaptiq is claiming a world first with Unmix::Drums, its new plugin. Using 'unmixing' technology, it's said to be capable of suppressing or boosting drum levels in a piece of mixed music. There are obvious potential benefits here for DJs and remixers, but Zynaptiq also claims that Unmix::Drums could be useful for mastering and production purposes. It's said to deliver everything from up to +18dB of boost to complete drum removal, and offers frequency-dependent control of key parameters, a high-precision analyzer display, M/S operation and an output limiter. 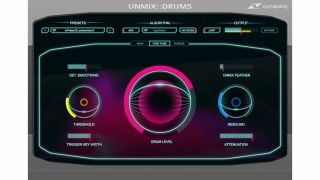 Unmix::Drums supports sample rates ranging from 44.1kHz to 192kHz and works on mono and stereo material. It'll be available in VST, AU, RTAS and AAX formats for Mac and PC, though we don't yet know when or for how much. Keep track of developments on the Zynaptiq website.